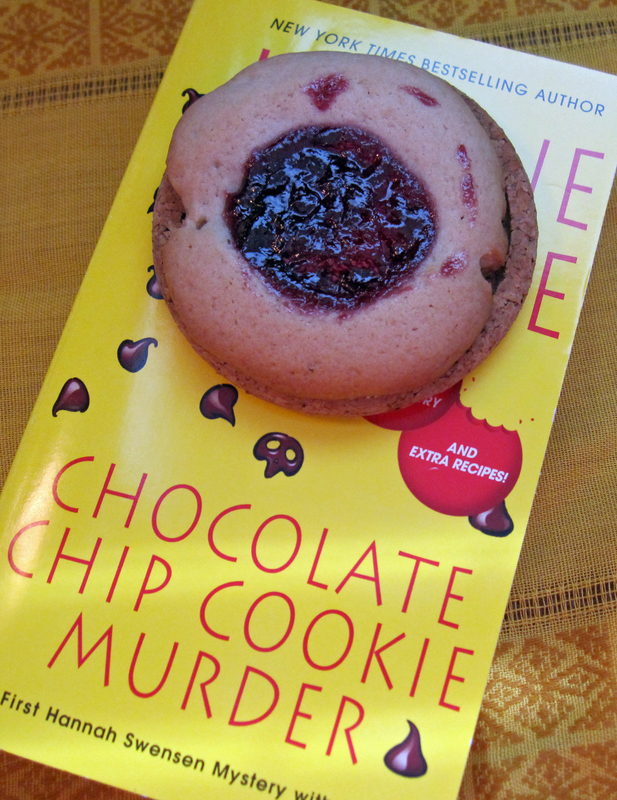 So few weeks ago I lost all my saved images of cookies/cakes from the Hannah Swensen book series that I have already done and not posted/published, so now I have to start from the beginning, which is not a bad thing…I can make a lot of delicious cookies again. Since Hannah mostly loves to make cookies. Click here if you haven’t read any of these books! And click here to see what I have already posted from Hannah! My goal was to bake 3 recipes from every book, so here we go, starting from the first book. Melt the butter, pour it to the mixer bowl (if you don’t have a mixer, use a regular bowl). Add the white sugar and mix. Melt the jam in the microwave or in a saucepan over low heat. Once it’s consistency of syrup, mix it in with the butter and sugar. Add the eggs, baking soda and salt. Mix. Finally add the flour an mix thoroughly. Cover and refrigerate for at least 2 hours. I had it in the fridge for overnight. When you’re ready to bake, preheat oven to 350 F.
Roll the dough into a ball, roll the balls in the sugar (which I didn’t do, I don’t like overly sweet cookies) and place them on a greased cookie sheet, 12 cookies per sheet. 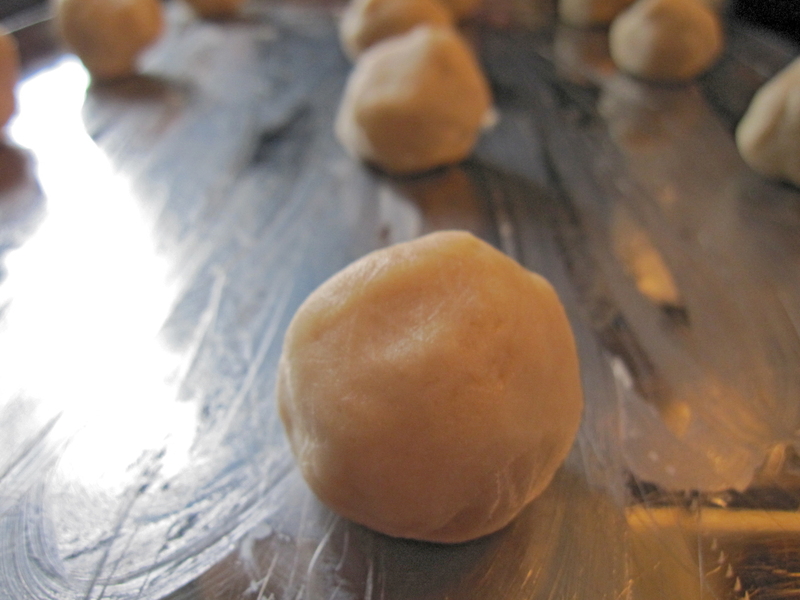 Flatten dough balls with spatula (I used a wooden spoon). 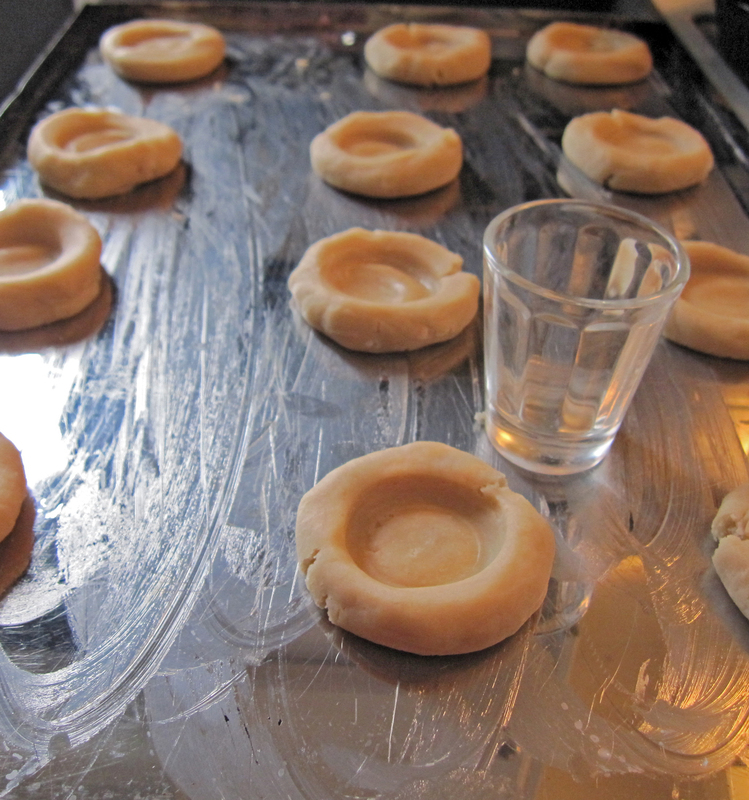 Finally make a small indentation with your thumb or index finger in the center of the cookie. 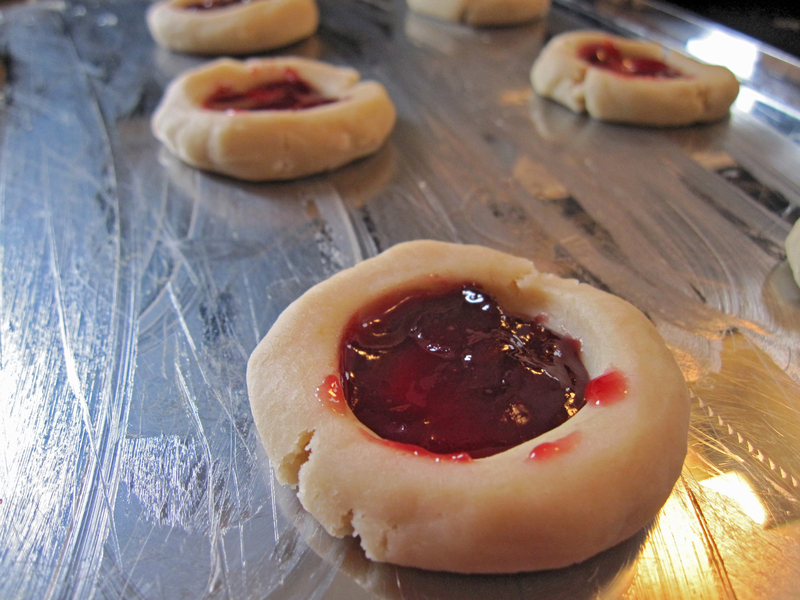 Fill the hole with a small bit of jam. I used about 1/3 of a teaspoon. These cookies freeze well. Roll them up in foil and put them in a freezer bag. Next ones up are Fudge-aroons. I’ve never heard of these!! I am pretty excited! You’ll love Joanne’s books! 😉 Check them out! This series is on my to read list, I just have so many others to get through first. Is it a good series? and those look yummy. Having a chance to re-do is a great thing when you can eat what you have to re-do.